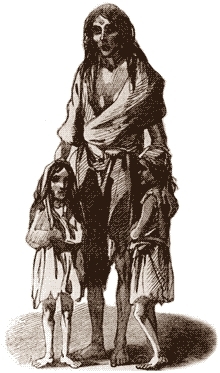 A depiction of a mother and her children in Skibereen during the famine. Even though we who have more than a passing interest in Irish history find ourselves in the middle of the much discussed ‘Decade of Centenaries’ and all which that entails, it is difficult to ignore the rather large, looming shadow which is still cast over the discipline by the events of the mid-nineteenth century. I refer of course to the Irish Famine of the 1840s. With much of the focus of this current period quite rightly trained upon the truly eventful decade of 1912-1922, debate around the Famine years continues to hold the imagination of the public and academics alike. Even though the vast bulk of Famine historiography appeared during the mid-1990s, coinciding with the 150th anniversary of those momentous series of events. Today questions and theories are still posed regarding economics, migration and Irish-British relations and what the legacies of those events are. The boom in Famine historiography during mid-1990s was multifaceted, with commemorations, government-funded research projects, a series of television and radio programmes, music, paintings and exhibitions. It also included for the first time many regional studies of the Famine, this too generated huge local interest as the events of the 1840s suddenly seemed a lot more personal and tangible. The bulk of Famine historiography appeared during the mid-1990s, with the 150th anniversary but today questions are still posed regarding economics, migration and Irish-British relations and the legacies of those events. Commemoration events took place in areas which were hugely affected by Famine, and in those which came through relatively unscathed. On the opposite end of the spectrum, Famine events featured in contemporary political discourse with the then serving British Prime Minister Tony Blair, in an act which perhaps designed to show some good peace-process related faith, publicly apologised for Britain’s role in the tragedy. With what may seem like a subject that has long reached saturation point, the uninitiated may be forgiven for enquiring as to what more can be said. The concise answer to this would simply be, quite a lot. The huge initial public interest in the Irish Famine naturally dissipated, with ‘Famine-fatigue’ being cited on both sides of the Atlantic, as early as autumn 1995, amid the profuse tributes. However, despite the amount of public commemorations it was noted that much about the great Famine remained hidden, waiting to be discovered and studied. While the historians and policy makers try to work out how the upcoming commemorations for the centenary of the First World War, The Easter Rising and the War of Independence can be marked in an air of inclusivity, the unearthing of new information on the Famine continues. Works on the Irish Famine are still being released, and still making headlines. Enda Delaney’s new study The Curse of Reason: the Great Irish Famine has been hailed as a welcome edition to the field with Times Higher Education describing it as a highly original account of a hugely traumatic series of events. Other works of note from the past year include, The Atlas of the Great Irish Famine, edited by John Crowley, William J Smyth and Mike Murphy, and the polemic The Famine Plot: England’s Role in Ireland’s Greatest Tragedy by Tim Pat Coogan, which have contributed to the increasing Famine historiography. Commemorations too, continue to take place on a local level, albeit with less fanfare and regularity of those which peppered Ireland in the mid to late 1990s during the 150th anniversary era. Drogheda hosted a successful event in May of 2012 with a two week programme of events, and in May of this year at Doonbeg Co Clare Irish President Michael D. Higgins delivered the keynote address at the local Famine Commemoration event. It is clear that in both academic and public circles, there is still unfinished business when it comes to debate around the Irish Famine. The continued importance of the Great Famine era covers many fields, aspects of which feed into at least one of the commemorations which will be with us in the next couple of years. 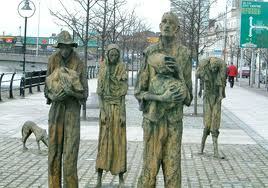 Migration and economics have been central themes in Irish Famine historiography in recent times. However, arguably the most contentious theme is the continued debate over England’s role and indeed, her culpability for the Famine. Given the warmer relationship between Ireland and Britain of late and the evolving Northern Peace-Process, the overtly nationalist sentiment which characterised the fiftieth commemoration of ‘The Rising’ will most likely be avoided, or at least greatly diluted. Nevertheless, the nationalism at the core of ‘The Rising’ can hardly be ignored, and England’s role at the root of this will almost certainly be explored. Throughout history anti-colonial nationalisms have incorporated historical validation for the aims of independence. And in the case of Irish nationalism the historical argument often draws attention to not only the conquest and colonisation of Ireland, but the traumatic events of the Famine which happened under that colonisation as justification for the sporadic incidents of armed insurrection right to 1916 and beyond. Because of this often fractured relationship, the importance of the Famine to nationalists continues to be highly emotive. Events such as Famine have been used as a literal call to arms, and in nationalist circles England’s role continues to dominate discussions. In turn, there has been a tendency to charge these revisionist historians with being apologists for the imperial policies which cost the lives of so many. That in itself demonstrates the continued importance of the field of Famine research. On to this summer and another Famine event which, by and large looks to steer clear of the more traditional arguments and aims to shed new light on events surrounding Irish society in the Famine years, as well as the effects felt in countries where the escaping Irish settled. July 19th & 20th will see the Centre for the Study of Historic Irish Houses & Estates, Department of History NUIM present the third annual International Famine Conference at Strokestown Park House, Co. Roscommon. The transatlantic gathering will be attended by academics throughout Ireland, alongside delegates from Britain and the United States. Issues as diverse as migration, integration, social mobility, and crime and punishment will be on the agenda with a number of standout papers which will undoubtedly breathe new life into debates in many areas relating to the tragedy of the large scale death and displacement, such as non-traditional routes of migration and the under-researched topic of infanticide in Irish society. Themes which continue to shape our understanding of both our past and many elements of our present. G. Kearns, “Educate that Holy Hatred”: Place, trauma and identity in the Irish nationalism of John Mitchel. Political Geography Issue 20 (2001) pp 885-911. Written by: Barry Sheppard on 2 July, 2013.